The longest-established and perhaps proudest name in automotive transport, Mercedes-Benz, has apologized to its Australian customers in a very public display of contrition. The company admitted it had been its own worst enemy, citing ‘internal politics’ as a major factor in the failure to deliver acceptable service to its customers. The breathtaking mea culpa came at BusVic’s Maintenance Conference and Bus Expo this month and was delivered by Justin Whitford, the newly arrived general manager of Australia’s bus division of Daimler Mercedes-Benz. In what might have been seen by some customers as a fitting gesture, Mercedes-Benz sponsored the opening day lunch at the Expo. Whitford is leading the revamp of the Mercedes-Benz bus and coach operations, having been appointed earlier this year from outside the Daimler group. He was previously with Sigma Coachair Group. "We are an organisation that led the Australian bus industry through innovation, relationship management and through product sales," Whitford tells the assembled delegates. "But, like many organisations, we did not work to improve our products or, more importantly, to enhance the services we were providing to our customers." "For the past few years internal politics have reduced our capacity and affected the experience many customers have had purchasing new products, parts and just gaining basic support structures." When he was appointed, Whitford said he wanted to incorporate more European safety technology as standard equipment in Australian buses. 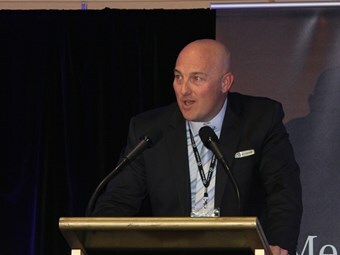 The BusVic conference lunch crowd was told the Mercedes-Benz bus and coach sales team had been grappling with more than just changing market conditions in the local bus industry. "Grant Simmonds, in particular, and his (bus and coach sales) team have faced many challenges externally and, more so, internally," Whitford confesses. "That has impacted our ability to service our customers both nationally and internationally and, in many cases, this should never have happened. "With that said, it is now time for Mercedes-Benz to wake up," Whitford says. "No longer will we talk about what we are going to change, but about what we have changed." External factors included the entry of a whole new range of competitors in the chassis, body and air-conditioning sectors. Whitford did not elaborate on the internal factors he cited. He did, however, give some idea of where the company has been falling down in relations to customer support. Part of the new bus dealer strategy will be a ‘stock bus program’ which will draw on offshore and local body builders to offer ‘a more appropriate product range’ and inventory. In addition, the company’s demonstration fleet will be expanded with the introduction of a new loan bus program. "This is to ensure that downtime is minimized when you have product issues, breakdowns, failures or even accidents," says Whitford. There will also be more support available through the appointment of several technical managers across the country. "I talked before about wanting to ensure we don’t make empty promises or talk about what we might do or will do in the future, as has happened over past years. "We’ve now signed off and will be appointing, as a first point of call, a NSW technical manager to look after the NSW region for technical and service capabilities and ensure that you are provided the support you need. "Those additions will continue and expand throughout Australia to provide the same resources in each of the key states around the country to make sure we can provide the program that you need." Whitford also says there would be product realignment and some new additions to the Mercedes-Benz bus fleet. "The Daimler brand is something you will see in the years ahead that will incorporate both the Fuso and Mercedes-Benz brands. "It brings together two unique offerings in both price product and in premium range. It is something that will change for us on the road ahead." Whitford says the company is planning to introduce a new Sprinter people carrier within the next 24 months. "We are building our first unit at this point in time in Germany and the three-axle 77 is another offer that we will also be looking at bringing it to this country. "That particular product, in conjunction with the Sprinter 45, will be here and released at a major gala event later in the year in November."